Weruva has been my top choice for grain-free canned food for a number of years. Pet food companies love to use the word “human grade” when describing their foods. What this really means is that the food is legally suitable and approved as nourishment for humans. Whether you would really want to eat it is another story. With Weruva, you might come close! The first time I opened a can of Weruva, I had a flashback to my childhood: the Paw Lickin’ Chicken formula looked just like the chicken fricassee my mom used to make. All of Weruva’s formulas are produced in a human food facility using many of the ingredients and processes that are used in products made for people. Their base proteins of chicken, beef and fish include only top quality muscle meat, such as white breast chicken, whole tuna loins and select cuts of beef. The first thing I liked about Weruva when I first started to research the brand is that they don’t even make any dry food. While cats who eat only dry food will generally drink more water, they still don’t get enough moisture to support all their bodily functions and essentially live in a constant state of low level dehydration, which can lead to bladder and kidney problems. Weruva’s diets are 80% water, which promotes urinary tract health. It is important to note that Weruva does not add excess water. Their formulas are naturally high in moisture because they remove the dry bone from the meat cuts and do not add in any fillers. The true test: will your cats like it? As with any cat food, the true test is whether your cats will eat it. “Eating” may not be the right word to use in this context: Allegra and Ruby practically hoover up their Weruva meals. I alternate raw food with canned food, and of all the canned food I feed, Weruva is the paws down favorite. Truluxe is Weruva’s newest line. It features five of Weruva’s old favorites as well as five new flavors featuring grass fed Australian beef, pink salmon, basa (a white fish), and turkey. Since I don’t feed fish, Allegra and Ruby got to test the Peking Ducken (chicken and duck) and Quick n’ Quirky (chicken and turkey) varieties. Both were a big hit. 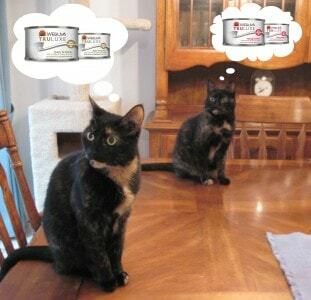 While I mostly feed Weruva’s original line, Allegra and Ruby have long been fans of Weruva’s Cats in the Kitchen, especially the Fowl Ball flavor (chicken and turkey). This line features cuts of white breast meat chicken and duck breast, delicate gravies, as well as loins from tuna, salmon and mackerel and lean cuts of beef. I first reviewed Weruva about a year ago, and I had a few concerns about the diets at the time. I prefer diets manufactured in the US, and Weruva is made in Thailand. I also prefer diets that do not have any ingredients that are sourced in China. Weruva sources taurine and a few of the minerals in China. David Forman, Weruva’s president, was very responsive in addressing my concerns at the time, and I’m still comfortable feeding these diets. You can read his responses here. For more information about Weruva, please visit http://www.Weruva.com. *This post is sponsored by Weruva on behalf of the BlogPaws Blogger Network, which means that I was paid to feature this content. I also received some free products from Wervua. Weruva did not pay me to be featured on my list of recommended brands. Weruva is not responsible for the content of this article. Hi Ingrid! What would you recommend me to feed my 10 week old kitten. I was hoping that Weruva had kitten formulas, but apparently they don’t. Can you please give me some suggestions. Thank you so much! Weruva can be fed to kittens, but it’s quite a bit lower in calories per ounce than most pate style foods, so you’re going to have to feed more. hello. i’ve been looking into changing my cat’s food to weruva but was disappointed to find so many of their recipes have fish oil. there are only a handful of the chicken recipes that do not but the truluxe looks promising. I really enjoy your site. I found your reviews most helpful! I am currently transitioning my (almost) three-year-old cat to Weruva from Wellness Core. To start, I brought home a can of Mediterranean Harvest from the Truluxe line and he devoured it, but I am now wondering about the other lines. There are quite a few, so it’s a bit overwhelming! I know that all of Weruva’s lines are healthy (high in protein, low in calories, grain free), but I’m finding it difficult to determine the difference between Truluxe, Cats in the Kitchen and the original line. Do you know what the main differences are between each line and which you would recommend as being the “best” one? Your help is most appreciated! I recommend all the Weruva lines, it really just depends on what your cat prefers, Melissa. I have been told by my Vet that cats need TAURINE in their food. Is this substance always added to the food or is it found naturally in some of the meats? It is absolutely essential that cats get taurine in their diet. It occurs naturally in muscle and organ meats, or is added as a supplement, depending on the manufacturer and the formula. Your blog is a godsend to me. My struggle, now that my cats have finally found paw lickin’ chicken and are swooping it up, is the low calorie content in the 5 oz can (103) as opposed to the Wellness 5 oz wet chicken formula they really didn’t enjoy (220 calories). So are you saying I should DOUBLE and give each a 5 oz can at each meal instead of halfing it twice? (breakfast and dinner?) That’s 10 oz. of paw lickin’ chicken a day instead of 5 oz. That isn’t too much? They are not particularly active 8 years olds — one weighs 9 lbs and the other weighs 12 lbs. I very much appreciate your opinion. You are very honest. Theoretically, yes, going strictly by calorie count, they should be eating a 5 oz can at each meal. That being said, my two girls, who weigh 7 and 8 pounds, split one can for each meal when I still had them exclusively on Weruva (I feed primarily raw now with an occasional meal of Weruva) and they maintained their weight just fine. I am very grateful for your quick reply. Last night, 2 hours later, I added 1/2 a 5 oz can more after they scarfed down their regular meal. They left part of it, causing me to maybe consider just starting with 8 oz a day instead of 10 oz and go by their reaction. Thanks again for your very much needed advice. I read your recommendations for wet cat food and I really loved Weruva. However my kitten is just 5 months old and can I feed him the Weruva chicken food as its meant for adults? Also if so would the quantity vary? And if not Weruva what other wet food do you recommend for kittens? An average 8 pound healthy, active cat requires about 250 calories a day. Mots of the Weruva varieties have around 100 calories per 5.5 ounce can (check the website for exact calorie counts for the flavors you feed). You will have to adjust according to your cat’s weight and activity level. You can find lots of information on raw diets on this site, Eve. Raw feeding is certainly the closest to feeding what cats would eat in the wild, but it’s not for everyone. I’m familiar with Wysong, and I appreciate you mentioning the “100 truths program,” but would like my other readers to be aware that it’s simply a way to get people to sign up for Wysong’s mailing list. I don’t doubt that the information you’ll receive can be helpful, but wanted to be sure people understand this before they go searching for it. If the information received through Wysong’s email list is informative, what’s wrong with that? Didn’t sound like a person is required to sign up to read the “100 Truths…”. 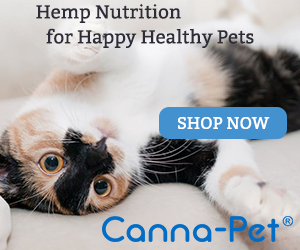 Your site and info is greatly appreciated, as are other sites offering nutrition info to pet owners for free. Wysong cat food is highly praised on the nutrition sites I visit and trust. Plus, their food is reasonably priced. Anya and Oscar are in LOVE with Paw Lickin’ Chicken, which we bought at your suggestion. And just opening the can, you can tell it’s all meat and gravy. But before reading your review on the TRULUXE foods, I bought a can of Peking Ducken a few weeks ago. The cats liked it, but I noticed that there were ingredients in this line of food that are NOT meat. Since our kitties are obligate carnivores, what are your thoughts about pumpkin, sweet potato, carrot, potato starch, potatoes, peas, and chunks of corn in the TRULUXE line of foods? I thought I was buying a meat only product. Not so. It seems like ALL of the cat food companies (even the good ones like Weruva) are using ingredients that our cats don’t really need. And looking at the Weruva website description of the various TRULUE ingredients, it looks like the only ones WITHOUT these veggies are their fish flavors, which we are trying to avoid. What are your thoughts about this, Ingrid. I really trust your opinion on these things, and I’m honestly confused. I don’t like seeing all the veggies in the formulas, Will, which is why we pretty much stick to the Paw Lickin Chicken and the Fowl Ball flavors. The actual veggies may be the source of some of the vitamins in the diet. This varies by manufacturer. The few times I’ve fed one of the varieties with visible veggies in them, Allegra and Ruby just ate around them. So the bottom line as to what I recommend (and feed): stick to the varieties that have few or no veggies added. Thanks Ingrid. Appreciate your insights! If you have any interaction with the Weruva folks, you might suggest this to them, too. It’s a shame for them to start a new line of cat foods with all those veggies included. You and others are educating people about what our cats really need. It’s too bad that even good companies like Weruva are formulating their cat foods to appeal to what people “think” cats need, instead of what’s really good for them! Again, thanks for the comment! 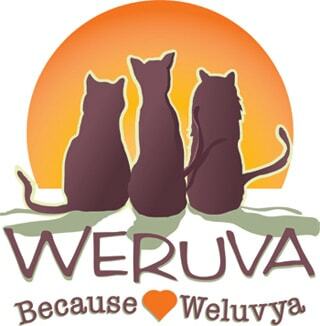 We’re BIG fans of Weruva…’specially the Cats in the Kitchen line. We’ll have to try the Truluxe line. I like that the company answered your questions Ingrid. We have not tried this type of food yet. Sounds like kitties really like it and it’s a good product. Thanks for the review. I’ve been a big fan of Weruva for the reasons you mention. It’s the only wet food I’ve been feeding my cat since I got him at 6 weeks old. But now he’s developed crystals in his urine and after two midnight trips to the ER, I’ve been persuaded by the vet to put him on prescription food. He eats it because that’s the only choice he has (no more dry food at all) but I really don’t like the ingredients in it. (pork byproduct at the first ingredient) I’d like to go back to Weruva but I’m concerned about the urinary crystals coming back. Any chance Weruva will develop a prescription formula? Thanks Ingrid. That’s just the info I’ve been searching for! The link in your article to Dr. Pierson’s site is very helpful too. Hopefully keeping him off dry food will help stop the crystal formation. Though what caused the crystals still seems like a mystery. Thanks for the review. I also am pleased to see that you do not feed your cats anything with fish which, as you know, has a negative effect on vitamin B (raw in particular) and even (often) if cooked. Weruva in general is pretty fish-heavy. Having been forced nose-deep into research in dealing with my hyperthyroid 16 year old cat I also learned that fish containing food is tougher on the can liners which brings me to BPA concerns. Weruva does make an effort to use BPA free containers but their vendor (according to W’s own website) no longer certifies that it may be so. It’s clearly a good food for canned food feeders and a much better choice than kibble (particularly of the usual store brand corn and animal bi-product variety). My creature’s been on the fence about this brand but for the chicken flavor I still added a dash of vitamins and human grade bone meal. Another reason why I don’t recommend fish is because I’m concerned about heavy metals in some of the large fish. I supplement everything I feed, whether raw or canned, with a good multi-vitamin supplement, and I also mix in a combination of digestive enzymes and probiotics with each meal. The BPA issue is a tough one. I, too, prefer BPA free cans, but I like that Weruva is completely open about the fact that they can’t guarantee that all cans will be BPA free. You mentioned that they remove the bone from their food. Isn’t some ground bone necessary for cats? I’ve been feeding my 2 cats Nature’s Variety Instinct frozen raw bites, which are made of meat, ground bone and organs. Isn’t that closer to what a cat in the wild would get when eating a mouse, bird, etc.? I thaw some of the bites in their bowls for 20-30 minutes, and Gordon and Jasmine love them! Bone is a source of calcium, and calcium is necessary for a balanced diet for cats. I believe Weruva adds calcium to their diets as needed to ensure balance. And you’re absolutely right, a raw diet with ground in bone is closer to what a cat would eat in the wild. My girls love raw food, too – I feed both raw and canned. We’re really glad to see your review of Weruva’s new line, since we haven’t had a chance to try it here. Ashton is a huge fan of Weruva Paw Lickin Chicken. It’s the only thing that finally broke her kibble addiction, and it helped her to shed her extra kibble weight, too. It’s good to see that they’re expanding their lines and giving more choices… and we hope this doesn’t mean the end of their current lineup! Paw Lickin chicken is one of our favorites, too. I love hearing that it broke Ashton’s kibble addiction – that can be such a hard thing to do. I’m still not a fan of anything made in the far east with ingredients from China and other questionable food-chain countries. Given it is made in a very low labor cost country, I also was surprised at the high cost of Paw Lickin’ Chicken, especially on a per calorie basis. Despite all that, I’m now giving it another try. Specifcally, the even lower calorie Truluxe Quick & Quirky recipe. This because I need a lower calorie diet for an overweight kitty and this formula is about as low as it gets! I wish a food of similar appearance was made by a reputable company in the USA, Canada or New Zealand, but so far I haven’t found it. It’s basically shredded white meat in gravy. Hard to beat that, assuming the food chain and manufacturing in Thailand is as high quality as we hope it is. I’m with you on this, Tim. I like everything about Weruva except the fact that it’s not made in the US. Unfortunately, there is no other food like it on the market at this time that is made in the US.